The Rev. McLaughlin was born into a traditional Ulster family in Magherafelt and as a young man of 18 was converted after attending a gospel tent mission in the Roe Valley. He then heard the call of God to full time service and joined the ranks of the Faith Mission before entering into training for the Gospel Ministry. For a time he served as a ministerial assistant to Dr. John Douglas in Lisburn and laboured in Markethill and Donaghadee in the same role. 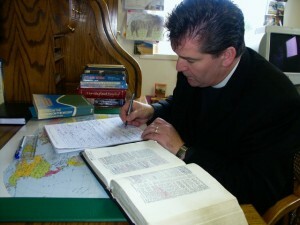 He was ordained to the ministry of the Free Presbyterian Church in March 1999 after having successfully completed a ministerial theology course in the Free Presbyterian Theological Hall in Gilford. Mr. McLaughlin is very much a family man being married to Rosemary and the father of four children, Miriam, Joanna, James and Mark. The burning desire of his heart is to preach Christ and see souls saved from their sin, for the glory of God and the extension of Christ’s kingdom on earth.